Exhibition organized for the Calvin College (106) South Division Gallery Grand Rapids, MI, in conjunction with Calvin's Wake Up Weekend. It was my genuine privilege to organize this exhibition in partnership with Matt Halteman and Adam Wolpa, orchestrators of Wake Up Weekend. 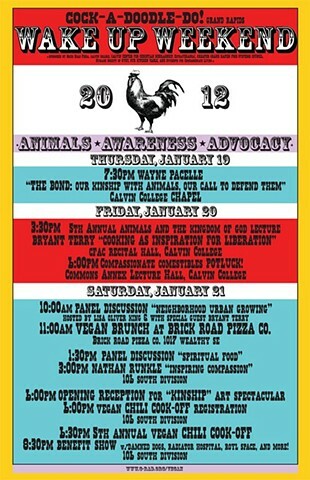 A series of awareness-raising events hosted annually by Calvin College, WUW is dedicated to advocacy on behalf of all animals, great and small. yet still imprison them, harvest their skin and bones and plunder their habitats for our own development. At minimum, such actions are an expression of grossly self-serving values; at worst, they suggest psychosis on a societal scale. I believe in a sea change  a slow, inexorable transformation in our understanding and behavior  and often feel adrift somewhere in the midst of it. As a nation we are increasingly interested in the origins of our food, and we are equally if not more invested in our companion animals. Other species have become our extended family in an era when we routinely find ourselves estranged through geographic circumstances, isolated by our work. Divorce rates have risen and all manner of familial configuration has been destabilized due to economic and environmental stress. Through this, the non-human animals we share our homes with have become our lifelines, emotionally, spiritually, even materially. The intent of this show is to make an appeal in our human voices on behalf of ALL other living creatures subject to the anthropocentric tendencies of our culture, to express the anguish and suffering that we are often unable to hear. Of course these beautiful creatures can and do speak for themselves, but not in language that we, with our limited experiences, commonly recognize. In addition, billions of our kin are locked away in darkened pole barns and cramped slaughterhouses, unable to be heard or seen at all. For decades biologists and ethnologists have observed the remarkable qualities of other species &#150; the creative intellect of crows, the signature whistles of dolphins, the elaborate social systems of wolves and elephants, the self-awareness of apes or magpies. Given the swell of evidence that attests to their sentience and the richness of their lives, it is increasingly indefensible to dismiss all we know in the interest of our human taste preferences, convenience, and base desire for cheap goods. As our understanding of the nuanced languages and culture of other animals becomes broadly accepted - part of mainstream consciousness - the privileging of humankind over all nonhumans will be rendered yet another chapter in our sorrowful, bloodied history. We - the artists of Kinship and organizers of Wake Up Weekend- are eager to help write the pages that follow.